(Fort Worth, Texas) --- Lanny P. Lancarte II, owner and executive tastemaker of Righteous Foods, has announced that Righteous will host its third annual version of Day of the Dead: Dia de los Veggies, on Friday, November 2, 2018. This year, the $15 ticketed event will feature tacos, drinks, entertainment such as a palm reader and works from local artist Adam Werner, as well as an optional 5K fun run around Greenwood Cemetery. 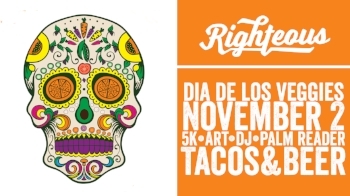 • Why: Join Righteous for Dia de los Veggies - our rendition of the Day of the Dead. Rather than a celebration of the dead, it's a time to celebrate food for the living. • How: The tickets are $15 per person, and they are available online here. Parking is available in UNTHSC garage 5. The event is limited to the first 100 who RSVP. The clean food eatery in Fort Worth’s Cultural District is known for its delicious, healthy food, served with a side of humor and irreverence. The restaurant focuses on responsibly-sourced ingredients and tasty bites. For more information and menus, visit www.eatrighteously.com, follow them on Facebook and Instagram, or download their app for to-go orders.